Venice is literally sinking into the sea. There’s a flooding season now, in autumn, where impromptu infrastructure appears stacked in the form of catwalks and bridges stacked near low-lying areas. 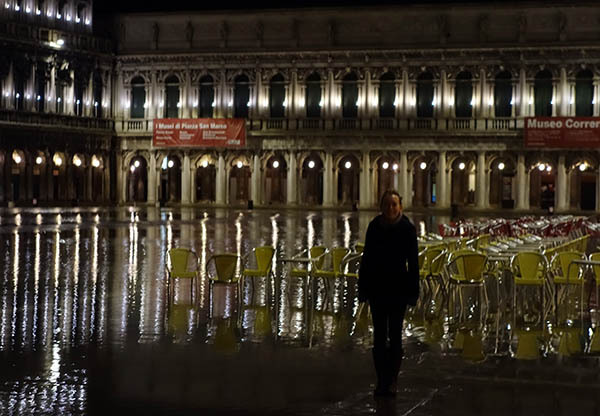 When the tide comes in, water flows up through the cracks of St Mark’s square at the same time as it pours from the sky. Venice, a completely unique city, is slowly disappearing. It may be the most endangered city in the world – and among the most visited. I don’t know how long it will exist in it’s present form before both deluges overwhelm it: the water, and the tourists. 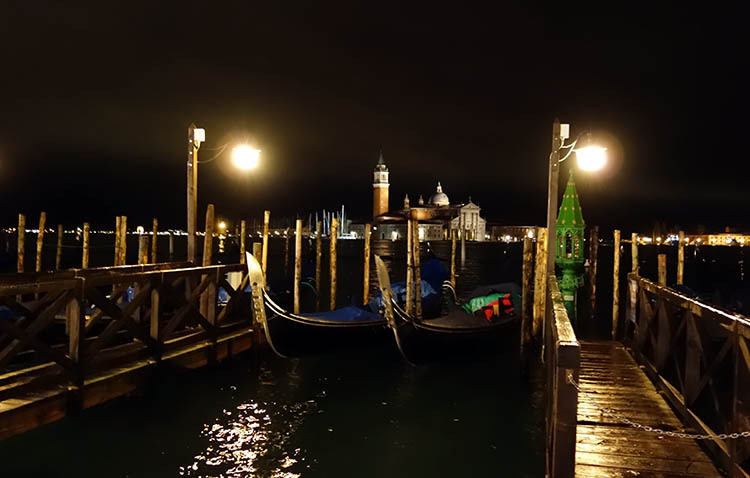 I’ve been interested in Venice, for some time and for a variety of reasons. The fact that it’s a pretty city makes it appealing – but also the peculiar history (I’d been interested since reading Empires of the Sea). And – I’d heard wildly divergent opinions. 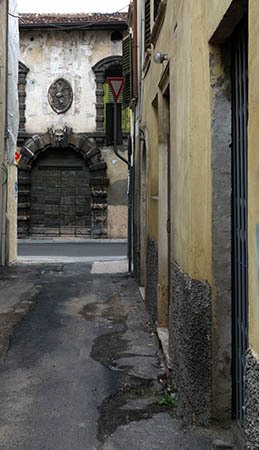 Some people said it was their favorite city in Italy; others, that it barely rated two days. My opinion, at the end, was split. You’ll see why. We woke up early in Verona, grabbed some snacks, wrestled with the coffee percolator (and lost), and left our lodgings. Before going to the train station, we stopped on the far side of the Arena, away from the Piazza Bra, at a small coffeeshop. Here, we were forced to acknowledge that we had no idea how to order a black coffee in Italy. Walk into a coffeshop and ask for a ‘caffè,’ the Italian word for ‘coffee,’ and you’ll get an espresso. Frankly, this is more my speed than drinking an entire cup of coffee, so I enjoyed the opportunity to get a little jolt of energy. Now in a civilized mood, we continued to the train station. From Verona to Venice is about an hour and a half by train. We shared a table with an older Italian couple who clutched pre-made vending machine sandwiches for the entire trip. I couldn’t believe how much they talked. Or at least, how much the wife talked, the man grunted. We dozed off on the train for a bit, and I only woke up as we started crossing the bridge to Venice. 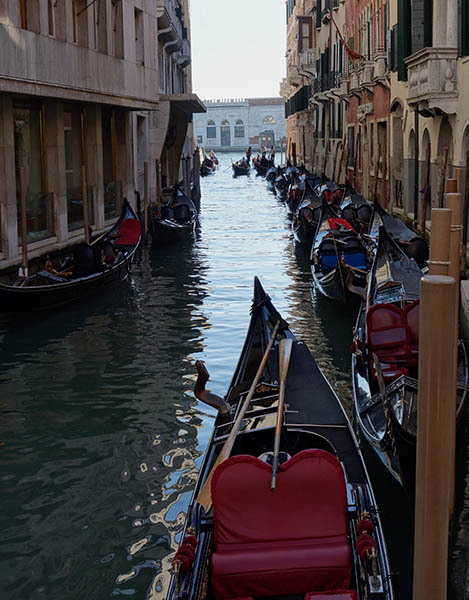 Venice is the only major post-Roman city in Italy; it was formed after the fall of the empire, when locals grew tired of being raided by semi-nomadic tribes. In an effort to escape, they filled in parts of a local lagoon and formed a man-made archipelago city (there are officially seven islands). For a long time, the only connection with the mainland was by ferry, something that made self-defense easy. Now, of course, so many people visit that there’s a thin curving bridge into the city. One island has a small area for parking, but besides that, it’s a city devoid of cars, which is awfully liberating: it feels more human. Plus, you can wander where you want without paying any mind to traffic. Getting out of the train station, we grabbed a city-tourist discount card which gave us unlimited trips on the local metro service for 76 hours. 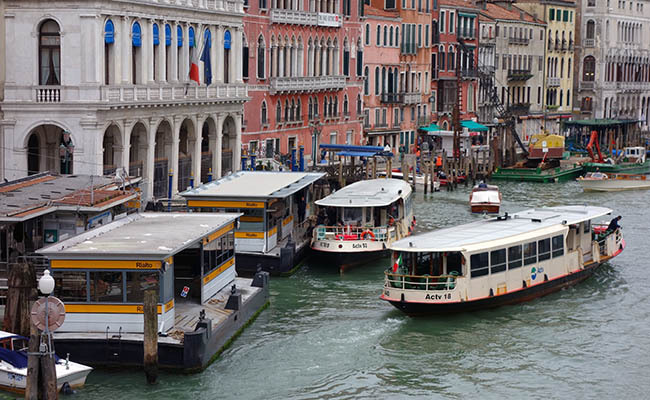 Rather than subways, buses or light rail, the metro in Venice is composed solely of ferries that cruise up and down the canals and around the islands. We’d take full advantage of these trips during our stay. Our first mission was to get to our AirBnB host. 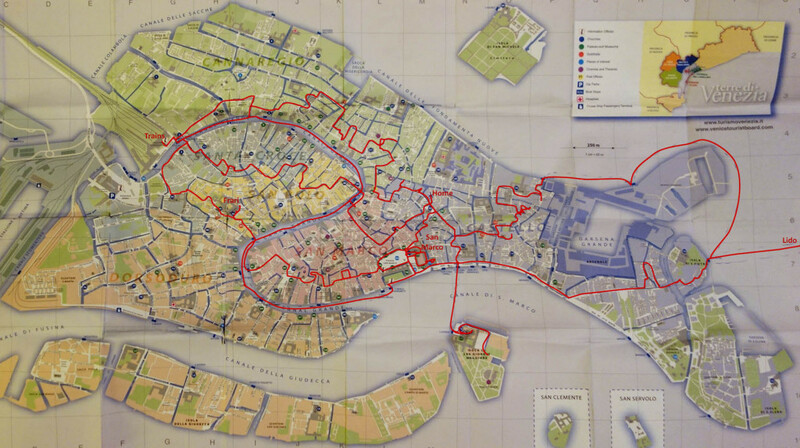 Rushing through the narrow streets, we grabbed a huge rope of licorice and made it to our lodgings in time for checkin. For the entire trip, we stayed with AirBnB. I’ve stayed with AirBnB hosts for many trips now. It’s cheaper than hotels, often more convenient, and feels more “authentic” (though hosts in Italy were more professional than in other countries). However, there’s one major downside: that AirBnB requires scheduling a meeting time with your host. You can check into a hotel at any point, but you check into AirBnB at one time. So, your schedule is more locked in than with other options. In this case, we were expected in Venice in at 1pm, so our schedule had to conform to that time. Venice is notorious for its confusing streets and the fact that it’s easy to get lost. Thankfully, we could compose a route to our host with only a single turn from the Rialto Bridge ferry stop, though this was somewhat roundabout. 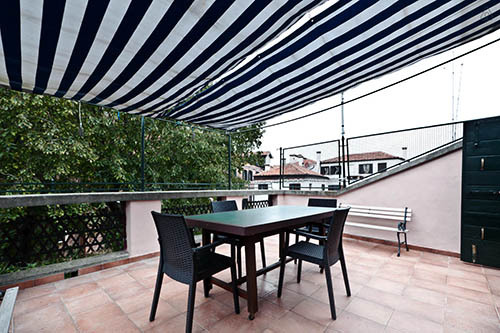 The location was superb, however, just 5 minutes from St Mark’s Square and 10 minutes from the Rialto Bridge, it was in striking distance of all the major sights. We’d be staying for two nights. The rooms were plush and there was a luxurious roof balcony. It would have been a great place to hang out, except that in November was just too cold and windy. Rough walking map over the course of two days. Backpacks dropped off and settled in, we headed out to wander the streets. 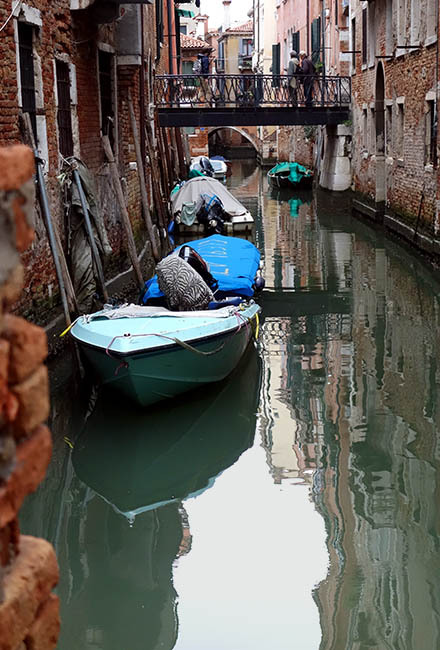 That’s really the best part of Venice – all the alleys and nooks and crannies hiding shops, apartments, and churches. At the end of our stay, I tried to reconstruct our route, tracing out the broad strokes, but the city is great for getting lost in, because you can never get *too* lost. You’re on an artificial island, after all. Mid-wander, we found a restaurant, dined on gnocchi and ravioli and wine, then found a supermarket (Coop, a popular Italian chain) and got really cheap wine. At this point, the weather finally made up its mind and started to rain, so we hurried back to the apartment to nap wait for clearer skies. The rain let up at 11 that night, and we headed out for our second round on the town. Another wander, this time a great arc northwest around the islands to return to the railway station, from which we caught a late-night boat back to the Rialto bridge, then headed to St Mark’s. 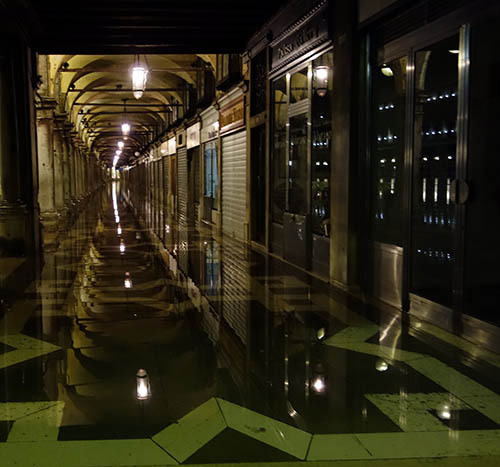 This corridor, which circles St Mark’s, is 6 inches higher than the square itself, and it also flooded over. It was flooded. We’d seen a bit of water earlier, during the rain, but the fact is: during the fall, St Mark’s floods, to depths of over a foot in some places. The local police put out elevated boards just wide enough to fit two people, and you can thread your way across the low-lying areas this way. It’s great fun. At this hour (somewhat after midnight), and given the rain earlier, there weren’t many people out. It was beautifully secluded, calm, not too chilly. During summer days this is one of the most crowded places in the world, but we had it almost to ourselves. I felt mesmerized by the place: St Mark’s has four prominent features: St Mark’s Basilica, which we would visit the following day; the massive sculpted entrance of the Doge’s Palace (we’d also visit this); the campanile or bell-tower; and what could be termed the arcade, or the gallery of super-high-end shops that surrounds the square. The square forms a rough L-shape, and when we first stumbled on it (in daytime), it took me a long time to come to terms with the layout – it was a case where my mental composition of photographs was totally distinct from the reality of the place. Nonetheless, I grew to like it, and we were lucky to see it so empty when the power wasn’t dissipated by swarms of tourists. We finally made it back to our AirBnB apartment around 2 in the morning. I carried a pedometer through the trip, and we registered 12.6 miles of walking over the course of the day. This entry was posted in Italy on December 21, 2014 by rob.